After a 14 hour plane flight and a 3 hour drive, Steinhart Aquarium biologists Bart Shepherd, Rich Ross and Matt Wandell arrived at Club Ocellaris and were treated to a breakfast of garlic rice, eggs and French toast. After filling our bellies, we suited up, went diving and have been on the move ever since. The first night, after a spectacular sunset,we dove on a stony coral dominated site called “Dead Palm” (apparently there used to be a dead palm tree under water). At the end of the dive we encountered something that we never imagined we would run into, never mind on the first night – Acropora sp. corals spawning. Thousands of egg/sperm bundles released into the water by branching corals filled the ocean with a peach colored ‘snowstorm’ rising towards the surface. Many screams of excitement could be heard under water. We collected some of the spawn, and after email discussions with friends from project SECORE (SExual COral REproduction – http://www.secore.org/ ), we tried to mix the gametes to harvest and settle ‘baby’ corals. The effort was not completely successful because Acropora corals cannot self-fertilize and we couldn’t collect material from multiple corals. Regardless, the experience was worth the effort, and sets the stage for future work. The collection of coral fragments has been moving along well, and we are getting ready to pack up the first shipment back to the Academy. We have been collecting fragments that have naturally detached from mother colonies, or harvesting small fragments from the growing edge of large colonies. The parent colony should quickly heal and show no sign of disturbance within a week or so. Traditionally coral fragments are collected and either glued to something (rock, a concrete disk, or a plastic plug) or left loose and stored in some kind of rack land in a holding tank. This presents a a couple of problems with water flow and water quality. It also can cause shipping problems, as the coral either sits unsupported in the shipping bag, or is rubber banded to some Styrofoam (both of which can stress the coral and involve additional handling). 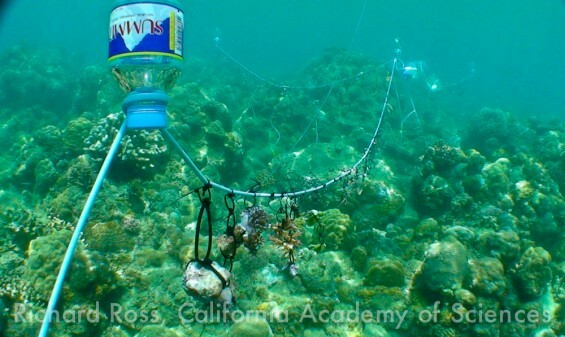 Inspired by the work Ken Nedimyer is doing in Florida at the CRF (Coral Restoration Foundation –http://www.coralrestoration.org/ ), and after prototyping the system in the Philippine Coral Reef at the aquarium, we placed our coral strings about 50 meters off shore. This system keep the fragments up in the water column with good water, flow and light until we are ready to ship them. For shipping, we simply snip the middle of the zip tie chain ( leaving the rest in place for future use) and attach the coral to another zip tie looped through some Styrofoam. This way the fragment is suspended in the shipping bag, and it will be hard for it to bump the sides or bottom, which can cause damage. The lines themselves are silicone airline tubing strung between repurposed plastic water bottles (floats) and dive weights (sinkers). Additional lines can be added to an existing float to quickly and simply extend the system. It seems to be working well and we are anxious to hear how the corals arrive at their new home in San Francisco. 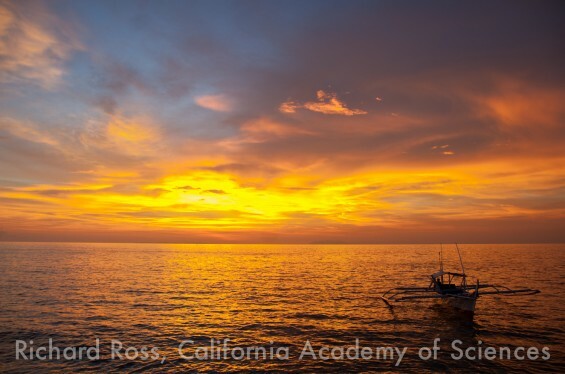 Last night we spent two hours muck diving collecting cephalopods and seeing amazing and bizarre creatures, but we are out of time so that will have to be covered in a future blog as we are off to Manila for meetings and shipping. Richard Ross, Bart Shepherd and Matt Wandell.